Of late I have been trying to step out of my personal comfort zone and try out new things. Since 2015 started I have only read book by authors I have never read before, experimented with my writing style and decided to put my inhibitions aside and finally give personal style blogging a serious try. Must admit, so far, so good! I owe this self-growth to my almost 4 years of fashion blogging. 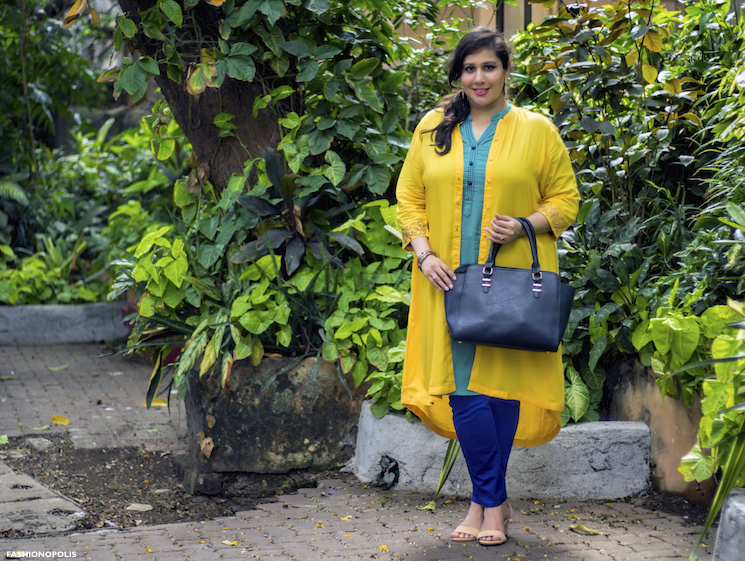 In many ways, I have learnt to accept the new and adapt to change thanks to my journey as a fashion blogger. The nature of the job is such; it requires you to step into uncharted waters for your own progress. Sometimes it can be tricky, most of the times it is rewarding. Everything from corporate attire to casual outfits to Indian ensembles is available under one roof. Trendin is a fashion lover's paradise. 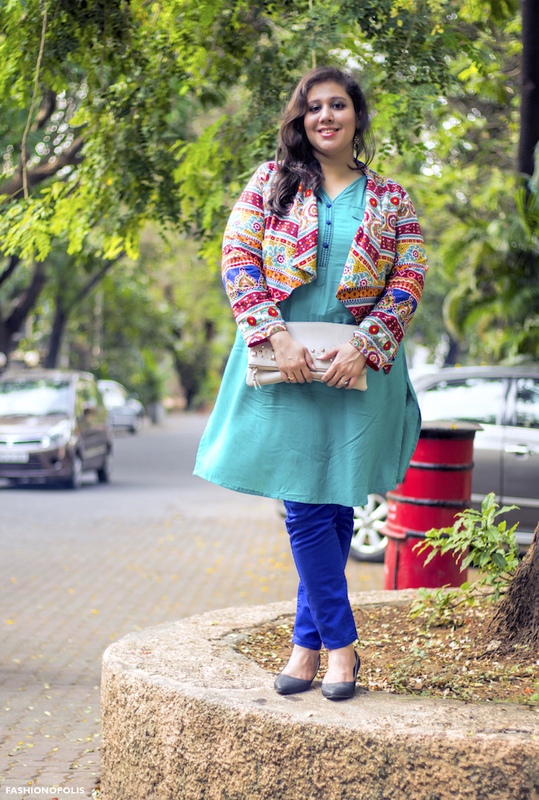 Being plus size I don’t always get my size easily on most Indian e-commerce sites. However, I was pleasantly surprised to find some really good pieces in my size. 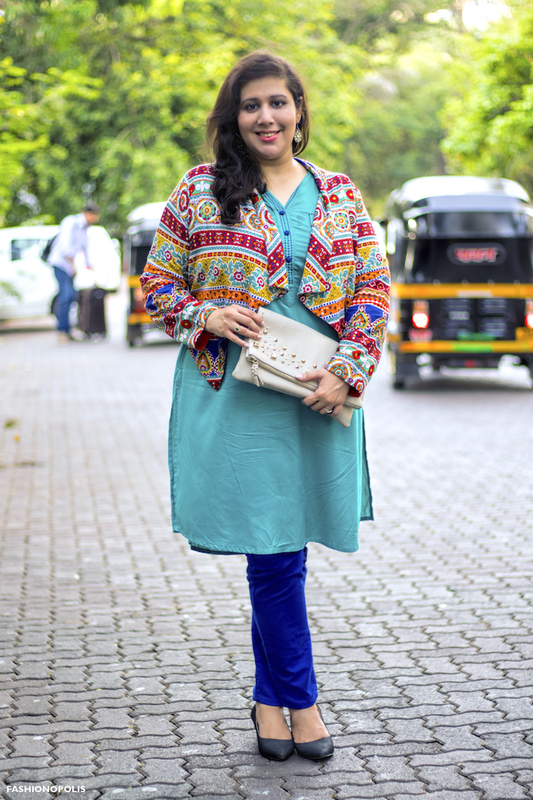 While the western section had limited plus size options, the Indian and fusion section did not disappoint. 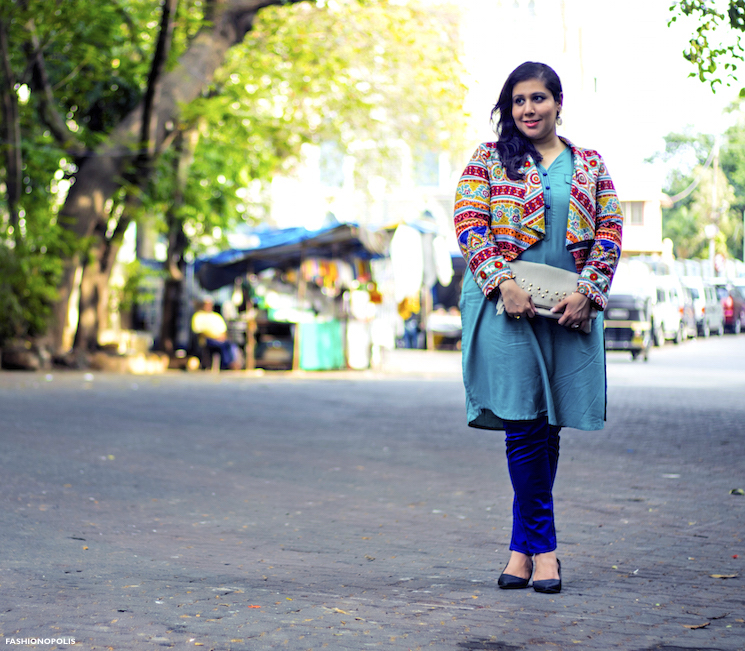 My love for layering is one of my major personal style evolution & achievement that is the direct result of blogging. Ever since I started layering clothes, I have been constantly experimenting with new ways of doing so. 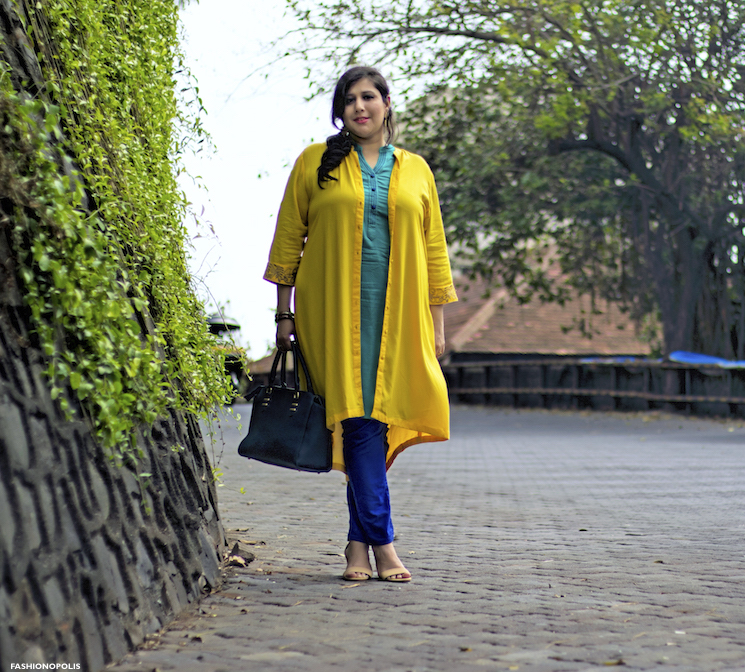 For my first look, I decided to layer two kurtas together- A classic fit, teal Rang Manch kurta with a bright yellow high-low hem, button front Rang Manch kurta. 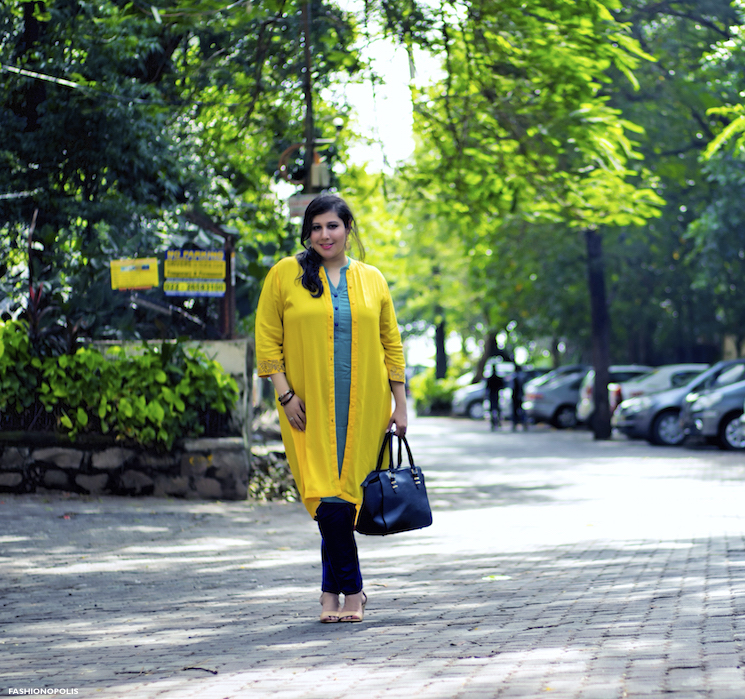 Opting to take a sartorial risk, I chose to style the yellow kurta in this manner so that it takes the form of a cape style jacket and gives the otherwise humble kurta an interesting contemporary spin. 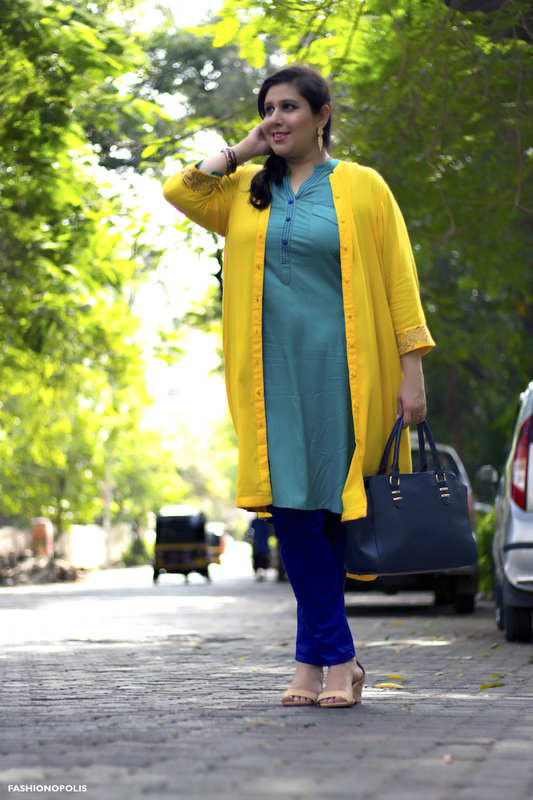 Completed this bright and colourful look with a pair of beige Van Heusen wedges and gold earrings. 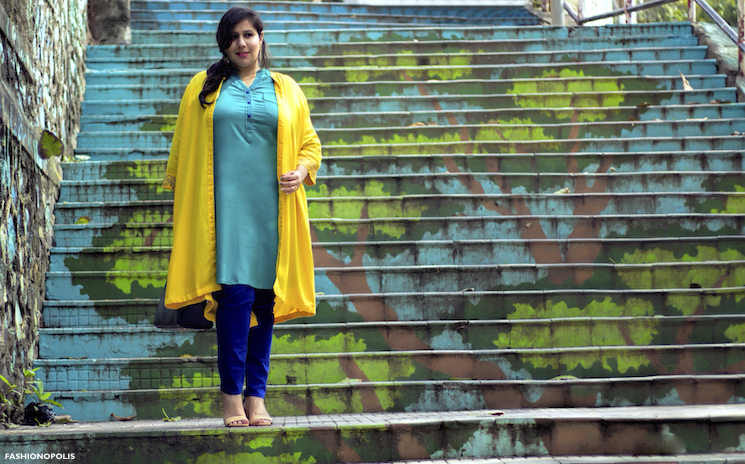 Along with layering, I love styling vibrant colours. I decided to style both the looks in contrasting colours, so that the final result is an eye catching colour block look. The second look is less street style and more everyday wear friendly. 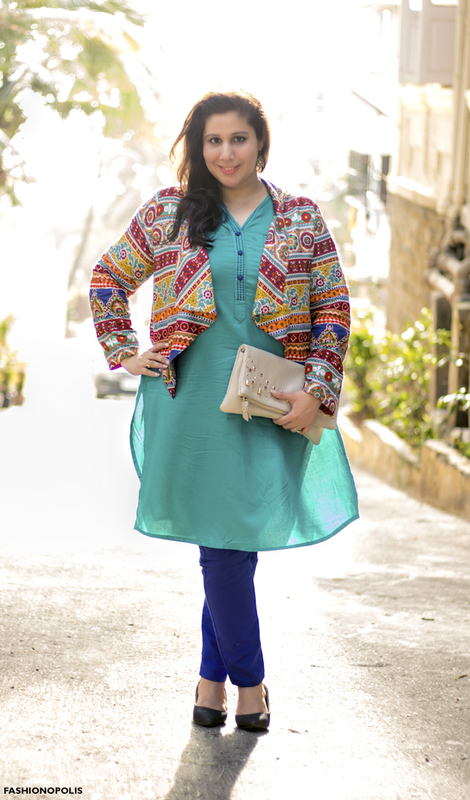 Swapping the long yellow kurta with a cropped multi colour printed Akkriti jacket. 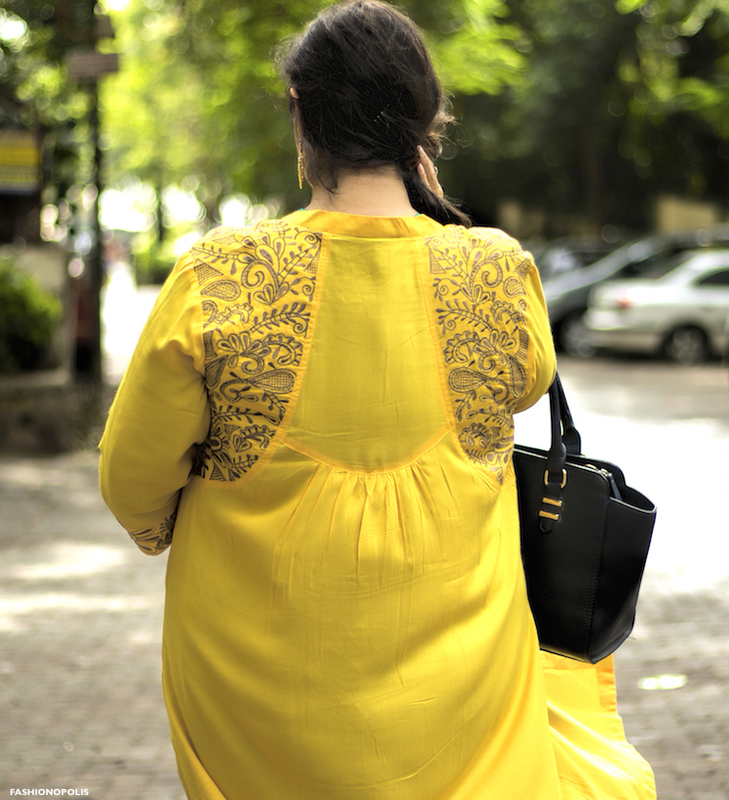 With just a silhouette and colour change, the traditional pairing of kurta and pants gets an interesting fusion touch that ups it style quotient by many notches. Along with being experimental, both the looks are plus size flattering too. The layering doesn’t add any bulk and the final look is sophisticated and chic. My overall experience with Trendin.com has been an extremely delightful one. From transaction to delivery everything was smooth sailing. I received my order in less than 24 hours of ordering. That was very impressive. Trendin.com is an initiative of Madura Fashion & Lifestyle and I am quite familiar with most Madura brands. Therefore I decided to try out brands I have never tried before. Form quality to fit to finish, I was glad I made this choice. Not only did I get to try out new brands, but I also got a chance to experiment with my looks. My only suggestion is, please add more plus size clothing options, especially in the western section. They were quite a few pieces that I had my eye on, but due to lack of size availability I had to forgo them. In love with the jacket you wore in the second look! So happy to see you sharing what you wear, keep going!! Gorgeous! Love the layered first look!